Darbys Performance Machine Inc. is based out of Fairbanks, Alaska. We started operations in Alaska when Steve Darby, a long-time racer of snowmobiles and motorcycles decided to open up his own shop serving the needs of powersports enthusiasts across the great State of Alaska. Steve was hoping to offer service, parts, and a dedicated machine shop specializing in serving the needs of fellow speed freaks and enthusiasts. Like many new start-up companies, it started in his personal racing shop to work on his bikes and snowmobiles and to help many friends out with their racing or recreational machines. As a racer in interior Alaska, Steve was frustrated with the knowledge base and services available to racers like himself. There were already shops in Fairbanks, but they mainly were aimed at the automotive industry and had very little knowledge of the powersports industry, especially two-stroke engines. As with most business’s, Darbys Performance Machine was started out of necessity to serve a very dedicated clientele, the Great Alaskan Sportsman. Alaskans love their toys!!! 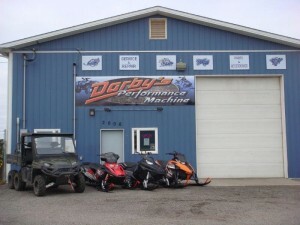 In 1992, with life savings in hand, toolboxes and a dream, Darbys Performance Machine Inc. was born. Within a couple of months the work was so overwhelming, it was time to move to a larger shop and hire his first employee. That employee, (another lifetime Alaskan) is still here 26 years later! Steve’s experience with motocross racing, motorcycle drag racing and motorcycle roadracing helped a great deal within almost every aspect of motorcycles and atv’s for the summer months. When hunting season was over it was time to bring out the snowmobiles. Again, Steve’s experience in racing drags, ice ovals, and cross country would continue to make Darbys successful. One of the things we wanted was to have an in-house machine shop where we personally did the work and could keep the quality of our jobs to a higher standard. Starting with a boring machine, a honing tank, and a press, we were off to a start. Little did we know at the time how successful and efficient this approach would be! Thousands and thousands of dollars of machine shop equipment and tools today let us provide a superior engine rebuild, done in-house, with the experience and knowledge only we have. We do much more than just machine work on engines though, we also specialize in full motorcycle, atv, snowmobile service and repair, or modification. Most everyone here at Darbys is a lifelong Alaskan with years of experience and knowledge of Alaskan needs….